Eugene, OR - With over 1,400 identified waterfalls in Oregon you might think it would be difficult to come up with a top 25 list. Not so for the folks at the Northwest Waterfall Survey. With a sophisticated method of rating waterfalls throughout the region, you can learn about the easily accessible iconic waterfalls and the intimate and unique waterfalls that may not show up on anyone&apos;s radar. With 4 of the top 10, and more in the top 25, rated waterfalls in Oregon located right here in the Eugene, Cascades & Coast region, you won&apos;t need to travel far to see the spectacular beauty that is easily accessible for all ages and abilities. 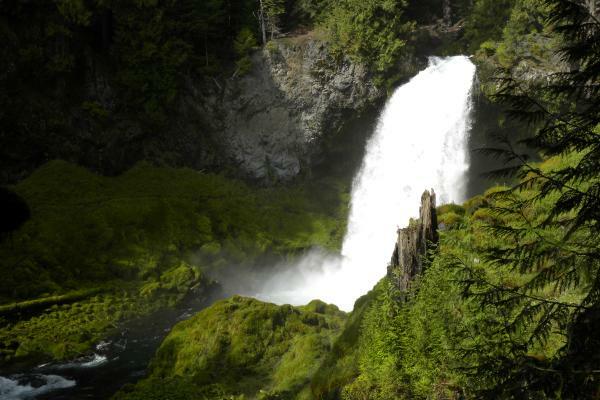 View our waterfalls page to view photos and videos of waterfalls in our region and then stop by the Eugene, Cascades & Coast Adventure Center and let our staff help you plan an outing to one of these top ten waterfalls or one of the many other waterfalls that will take your breath away. Help spread the word on how we can all help protect and maintain our spectacular recreational areas. Read about the Tread Lightly programs. Travel Lane County markets and promotes the Eugene, Cascades and Coast region as a destination for travel, conventions, sports, meetings and events. It serves as a private, nonprofit association dedicated to economic development through visitor spending, which pumped more than $676 million into Lane County, Oregon&apos;s economy in 2017. EugeneCascadesCoast.org.